Recently, I have been meeting a lot of cancer patients and sadly, one gets cancer even with good eating habits. However, I am always reminded of what foods to avoid and though I know cockles and shellfish are some of the most ‘toxic’ stuffs, I sometimes give in to temptations. In as much as I want to stick with healthy eating, there are occasion when I tell myself that ‘eat or not eat, also die’ so I eat. So, I still have that occasional lok-lok. 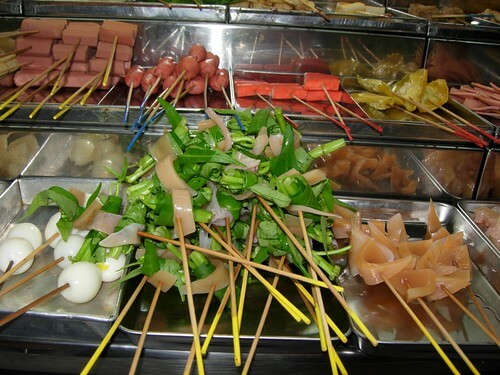 These are tiny sticks of different kind of foods strung on bamboo sticks, dipped into a boiling pot of water and then, dunk into various sauces. 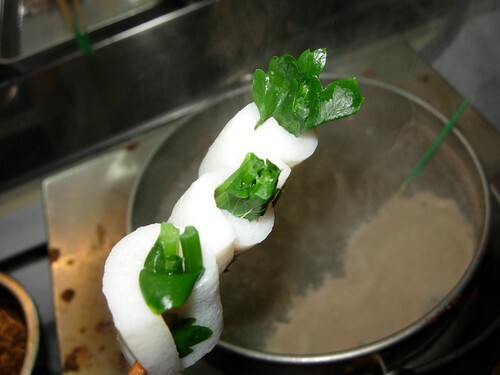 Though I try to stick to the more ‘natural’ foods like the above fish cake wrapped around coriander leaves (yummmm), I must have a stick or two of bloodied cockles and liver. 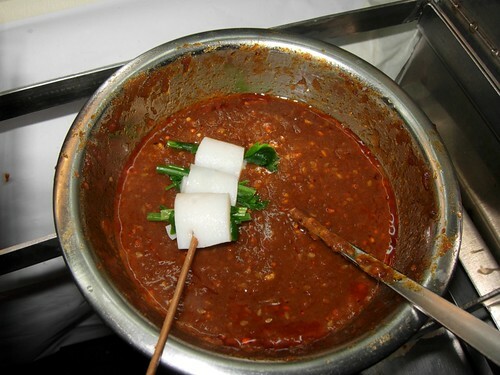 Some good lok-lok stalls or pushcarts have so many types of sauces like tomyam, satay, super hot green chillies, sweet sauce and garlic and lime chillies sauce. I just hope that one day, I don’t regret having those sticks of possibly cancer causing foods like the cockles and livers. My first taste of lok lok was in Penang and I do not regret it…once in a while indulgence could not possibly do any harm. We do have to die one day, lok lok or no lok lok…. Don’t be an idiot. Cancer IS NOT CONTAGIOUS, NOR DO YOU GET IT FROM EATING SHELLFISH/LIVER. The only disease that you can catch is food poisoning, and even that one may self inflict with one’s own cooking. If anything, eating seafood carries a risk of being infected with a self limiting viral infection known as hepatitis A and not hepatitis C. BIG DIFFERENCE!!! You can only contract hep C through the direct transmission of bodily fluids- Not via boiling hot water. Even a mother with hepatitis C has an extremely small risk of passing it to her unborn child.